High Purity Alumina Market segmentation: by product: 4N, 5N, 6N; by application: LED Application, Semiconductors Application, Phosphorus Application, Other Application. High purity alumina or HPA is a high-end product of the non-metallurgical alumina market. It is a high-value product that serves as a base material for the manufacture of sapphire substrates used in various applications such as scratch-resistant artificial sapphire glass, light emitting diodes (LEDs), and semiconductor wafers. HPA is also used as a phosphor material in plasma displays and as a major component in protective coatings in its powder form. 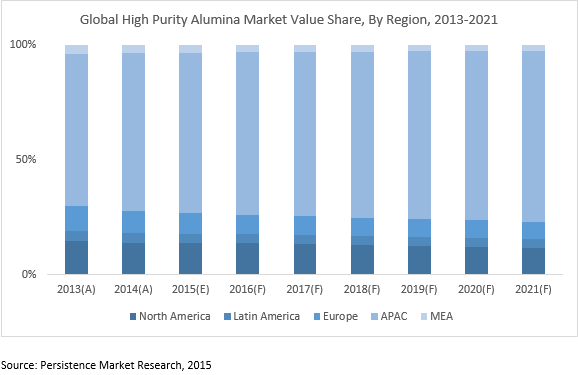 The primary objective of the report is to offer updates about the advancements in the global HPA industry that have given rise to the use of high purity alumina. The product segment is further categorized as 4N, 5N, and 6N HPA. On the basis of application, the market is further categorized as LED, semiconductor, phosphorus, and others. This report covers the HPA market performance in terms of value and volume contribution. This section includes PMR’s analyses of key trends, drivers, restraints, and opportunities that influence this market. Impact analysis of the key growth drivers and restraints, based on the weighted average model, is included in this report to better equip clients with crystal clear decision-making insights. Key factors driving the global HPA market include the booming market for LED lighting and displays, wider application in smartphones, and government support for the production of HPA products. Regions covered in this report include North America (U.S. and Canada), Latin America (Brazil and Mexico), Europe (Eastern and Western Europe), Asia-Pacific (China, Japan, and Oceania), and the Middle East & Africa (GCC and South Africa). In 2014, Asia Pacific dominated the market accounting for over 60% share of the overall HPA market. North America ranked second in 2014, closely followed by Europe. Meanwhile, Asia Pacific is anticipated to be the fastest growing region, both in terms of value and volume, during the forecast period. High Purity Alumina (HPA) is a high-end product of the non-metallurgical alumina market. It is a high value product that serves as a base material for the manufacture of sapphire substrates that are used in various applications such as scratch-resistant artificial sapphire glass, light-emitting diodes (LED), and semiconductor wafers. Demand for HPA is principally driven by increasing adoption of LED products, lithium ion battery separators, sapphire glass for smartphones, and smart watches. HPA is used as a phosphor material in plasma displays and as a major component in protective coatings. The price and performance of high purity alumina varies depending upon product density, particle size distribution, and degree of purity. The global HPA market is expected to increase significantly at a CAGR of 19.7% in terms of volume, during the forecast period (2015–2021). The market is segmented on the basis of region, product, and application. In 2014, 4N was the largest product segment, accounting for 54.1% share of the overall market, while the remaining 33.1% and 12.8% market shares were held by 5N and 6N product segments, respectively. On the basis of application, the market has been segmented into LED, phosphors, and others. In terms of volume, LED was the leading segment in 2014, accounting for 54% market share and is estimated to reach 60% share of the overall market by 2021. This segment’s growth is attributed to increasing demand for synthetic single crystal sapphire, which is used as a base substrate in the manufacture of LEDs. In this report, the global HPA market has been segmented into five major regions including North America, Latin America, Europe, Asia Pacific, and the Middle East & Africa. Of all the regions, Asia Pacific dominated the overall market in 2014 with over 60% share. Moreover, China accounted for approximately 45% market share, in terms of volume in 2014. North America ranked second, accounting for over 13% market share followed by Europe in 2014. Meanwhile, Asia Pacific is anticipated to be the fastest growing region, both in terms of value and volume, during the forecast period. Key market participants covered in the report include Sumitomo Chemical Co., Ltd., Orbite Technologies Inc., Alcoa Inc., Altech Chemicals Ltd, Baikowski SAS, Nippon Light Metal Holdings Company, Ltd., and Dalian Hiland Photoelectric Material Co., Ltd.
Dalian Hiland Photoelectric Material Co., Ltd.